Taking its name from the world of classical composition, Perpetuum Mobile fulfills a key requirement of its musical reference by establishing a series of repetitive motifs that elude predictable transition points, but it forgets something vital: a good melody. 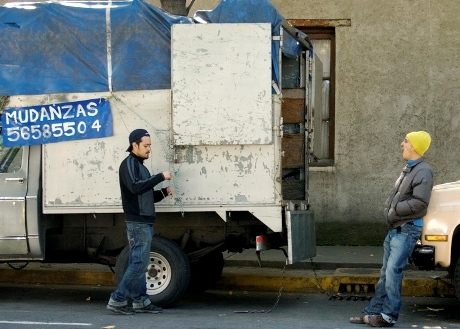 There isn't any distinct or memorable narrative trajectory to Nicolas Pereda's 2009 film about a lazy Mexican moving-truck driver; life just happens around him. While it's worth noting that life and death are simply changes of state in the perpetual march of an unremarkable existence, the way Pereda goes about stating it doesn't make for an emotionally engaging or mentally stimulating viewing experience. He demonstrates some thoughtfulness about his shot compositions, sticking to static frames when filming a situation that isn't going anywhere, and allowing the camera to roam more when a scene becomes charged with the potential for some—any—kind of change. It takes a little while for it to become clear that the protagonist is Gabino, a young man who lives with his mother. When he's first introduced, it's from a distance as he and his mover buddy stand around killing time – a recurrent facet of their relationship.After a lengthy intro featuring an old woman singing, Pereda spends a lot of time following Gabino's mother, whose reproachful attitude towards him swiftly escalates to reveal a full-blown needy nagger. She's lonely. So lonely that the degree of displaced affection she foists upon her canine love-surrogate comes off a wee bit uncomfortable. Her situation is indicative of the type of minor key arrangements Pereda is playing with. Everyone's got someone or something to neglect, and some method of trying to cover that hole. If the dialog (or maybe the translation?) was better, maybe the assorted situations Gabino drifts through in his furniture moving gig would feel profound, but as is, Perpetuum Mobile feels like the very kind of ill-use of time it seems to warn against.